Customer Acquisition in E-Commerce: Force the sale or build a relationship to convince the customer to buy? Your e-commerce relies on sales to grow and you constantly seek to understand the best strategies and tactics to keep growing. Of course, you want to generate sales as fast as possible, but is generating sales right away the only way to grow or even the best strategy? Learn about two different approaches to growing sales for your online store. It is natural that an e-commerce manager has the eagerness to generate sales as fast as possible. This is the modus operandi of much of the market. Just because it is the norm, many managers do not see an alternative to this sales generation approach at all costs. I highlight the two strategies: (1) purchase of traffic focused on the immediate sales and consequent retargeting in the case of non-purchase and (2) permission purchase (opt-in) focusing on the relationship and construction of the sale over time. This is the classic strategy. Create social and search engines ads with the goal of bringing the consumer to the site and try to convert the sale immediately. If you’re unable to convert immediately, we try to convert this consumer through retargeting ads with a few days’ window. The focus of this strategy is a short-term result. It is the goal of the month to be beaten. In this strategy, we seek to conduct campaigns to gain the user’s permission to interact with him, the so-called opt-in, using ads to generate traffic in conjunction with tactics for on-site lead capture and the use of lead capture ads such as Facebook Lead Ads, Twitter Lead Generation Card and other more innovative solutions like LeadGrid . This strategy begins to be perceived by managers as a solution to generate sales growth in the long-term. When analyzing the two strategies, the manager needs to understand the difficulty of converting the sale in each case. What’s harder? Convince the consumer to buy immediately or persuade him to buy over time? The immediate conversion strategy requires an effort to make consumers buy even if they are not in the right moment for it, that is, they may not be needing, wanting or being able to buy that product. In addition to being a huge effort to make it buy in this situation (high CAC — Customer Acquisition Cost), the consumer may not develop the best relationship with the store because they did something that they did not want or could not do. The permission purchase strategy requires much less effort as it only has to gain a permission from the user. This permission can be on several channels, the main one being email, but also for social networks. That is, the first goal is to get the consumer opt-in to some communications channel and then develop communication with that consumer and make sure that they have their brand in mind when they are ready to buy. However, this strategy requires a continued communication plan. But this is not a problem, as brands generally already have this plan in progress to develop the repurchase of current customers. There is a clear trade-off between the two strategies. The first is more expensive and faster, the second cheaper and longer. In the immediate buy strategy, we need to look at the ad conversion rate and the cost-per-action (CPA) where the action is the sale. In the permission purchase strategy, we first looked the lead conversion rate and, secondly, we measured the conversion of those leads into sales. Another important metric is the Customer Lifetime Value (CLTV). Customers conquered by the permission strategy usually have a higher CLTV since their buying decisions are more based on the reason and real desire to buy from a brand rather than in immediate purchase campaigns where the impulse to buy are often the real reason for the sales. Customer retention, i.e. keeping the customer making new purchases after the first purchase, is something that must be done regardless of the strategy. Since you already have made the customer acquisition effort by immediate sale, there is no reason not to maintain a retention and repurchase strategy. The implementation of the permission purchase strategy requires a good communication plan for retention and repurchase. This plan becomes essential for the success of the strategy. And the most interesting is that this plan will also help in the immediate buying strategy. One important insight is that retention campaign gets much easier when the lead has been captured through a permission and relationship campaign. When the customer came from an immediate sales-focused campaign, the sale was often for a momentary need when there is no consumer interest in maintaining a longer-term relationship with that brand. For consumers who have agreed have a relationship with you, receiving news, promotions and content are something they expect and the conversion of the first sale becomes easier. Both strategies are complementary and should be used by all online store managers. But how much focus and investment should we devote to each of the strategies? 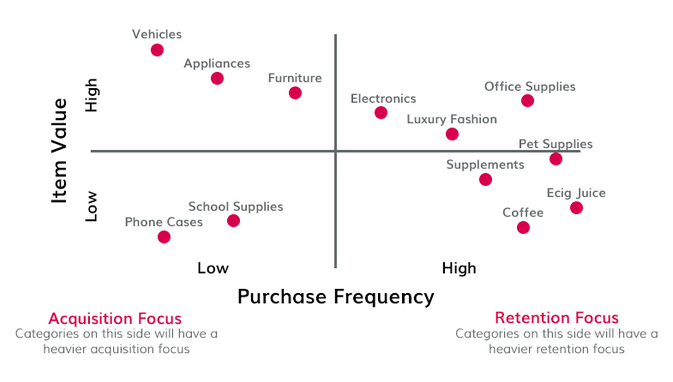 To better determine the focus, two important aspects need to be analyzed: working capital and product category/purchase frequency. The rule is simple. You should prioritize investing getting users permission whenever possible, but since this is a strategy that delivers results over time, you need to have the cash to support those marketing costs until the conquered consumers actually buy. With no working capital, something very common in newly launched stores, it is necessary to focus on immediate sales generation campaigns so that the business begins to run. But as soon as there is some cash, it is important to start transferring the investments also to permission acquisition campaigns. If you do not make this transition, you run the risk of becoming dependent on immediate sales campaigns, which may look good in a simplistic and short-term view, but it is bad since this client tends to have a lower CLTV and consequently an ROI ( Return on Investment). Products bought more often are better served by permission buying campaigns as consumers relate more to brands of product categories they consume more often. Pet supplies are a good example. Pet owners are always in need of purchasing this category and so tend to relate more to brands in that category. On the other hand, categories with lower buying frequency are better served by the immediate buying strategy. They are products where consumers often do not relate to brands often. A dishwasher, for example, you search for only when you need it. You do not start a relationship with a dishwasher brand thinking about the next device that you will buy in 4 or 5 years. Products to the right of the vertical axis, are better served by the permission purchase strategy. The strategies presented here are put into practice through various marketing channels. A good tip to find out which channels work for your store is the bullseye framework presented in the book Traction by Gabriel Weinberg and Justin Mares. When deploying the permission purchase strategy, an important point to consider when choosing channels and ad/content strategies is the lead quality in each channel. The success of your permission campaign is directly tied to the quality of the leads. There is no point in building a subscriber base for a newsletter if those consumers are not within the demographic profile of your brand and will not, in fact, consume products from your store. Choose channels that deliver quality leads or work on campaign optimization focusing on the desired consumer profile. At LeadGrid, for example, the quality of leads is high since the platform captures leads on the thank-you pages of the online stores, that is, always online consumers with purchasing power and who have shown interest in your store and also because we optimize the ads to that specific customer. Knowing how the buying decision in the head of your consumer works is high-value knowledge for the online store marketing manager. Understand how various acquisition strategies can be used to maximize the return on your marketing investments as well. Try out various strategies and do not let the short-term vision hide the potential of having a high CLTV consumer base contacts.